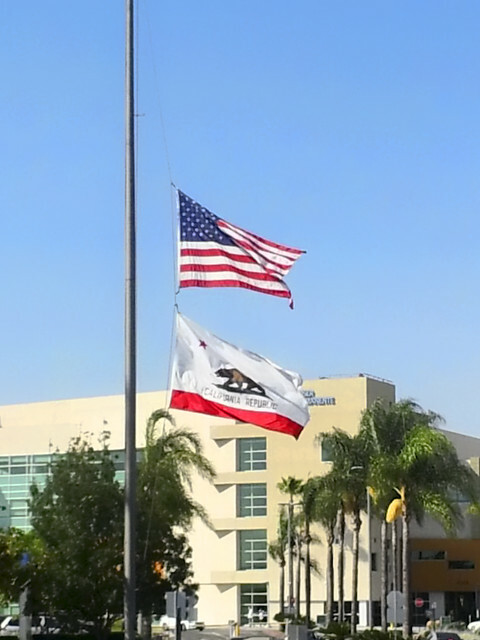 The flags at Los Angeles County Office of Education (LACOE), where I work, have been flown at half staff this week. I inquired as to the reason and learned several new things. First, LACOE will fly the flags at half staff only by order of the governor of California. Second, this occasion of flying the flags at half staff originated from a presidential proclamation in honor of the shooting victims in Wisconsin. Third, the website halfstaff.org has the information regarding any national or state occasion of flying the flags at half staff. Fourth, http://en.wikipedia.org/wiki/Half-staff has a great article detailing the history, current usage, proper procedures and symbolism of flying flags at half staff. Yesterday I knew the general principle of flying a flag at half staff, but today I know why, and where to find to whom to pay honor.